If you are still using “regular” table salt in your diet, then please read this! It’s about crystal salt, one of my all-time favorite self-help health aids. And like coconut oil, raw apple cider vinger, and other faves, it’s simple to use, inexpensive, all-natural and has soooo many benefits and uses, both internally and externally…. But the substance that shows up on most American dinner tables these days is far removed from the form of salt that enjoyed such an illustrious past. The sodium chloride, or refined salt, that is used in our diet in such abundance today has been chemically cleaned and purged of its “impurities,” which, unfortunately, are really important, health-giving minerals. And, modern day table salt usually comes with additives, such as aluminum hydroxide, stearic acid, sodiumferrocyanide, and more—some of which can be toxic. When ingested, the body recognizes highly refined salt as a poison and accumulates water in and around the cells to protect them from this invading substance. This process causes swelling, edema, and cellulite, and puts the body in the position of having to spend a great deal of time in “elimination mode,” rather than expending its energy on regeneration and renewal. Salt in its refined form is basically energetically dead—instead of serving to enhance vitality, it actually causes a depletion of the body’s energy reserve. So instead of being a “divine substance,” salt has been transformed into something that’s not only devoid of nutrients, but also now linked to a wide variety of dis-eases, such as high blood pressure, osteoporosis, kidney problems and edema. Fortunately, all of that isn’t the case with Himalayan crystal salt, an ancient pure salt still in its natural state. It’s been compressed over time (250 million years, in fact!) by great mountainous masses to form a crystal matrix—this matrix is extremely important because it insures that the various minerals in the salt are attached in a way that makes them easily assessable by the cells of the body. Salt with this crystalline structure hydrates the cells, contains vital life energy, and charges bodily fluids with spare electrons. All these spare electrons make the salt a powerful antioxidant—and the only one that works everywhere in the body. In addition, other antioxidants are enhanced in their effectiveness when in the presence of this special salt. The importance of antioxidant protection in regard to maintaining good health has become common knowledge in recent years. Free radicals are now considered to be the single most significant cause of premature aging and degenerative diseases. A free radical is a molecule that is missing one or more electrons needed to be in a state of balance. Since seeking balance is intrinsic to everything in nature, free radicals aggressively steal electrons from every source they can find. In the human body, the phospholipid membranes of the cells, unfortunately and to our great disadvantage, end up being a great supplier of electrons for free radicals. By losing electrons, cell membranes literally become rancid and dysfunctional, and accumulated damage shows up as premature aging, as well as virtually every disease known to medicine. Antioxidants are nature’s way to minimize this ongoing damage. They can give spare electrons to free radicals, thus neutralizing them without damage to the cell membranes. While there are many antioxidants that are very health enhancing, they all have one fundamental limitation: They work only in some areas of the body. Vitamins C and E, for example, provide fine anti-oxidant protection in the blood vessels and in the extra cellular fluids; however, they do little inside the cell. And selenium works well in the blood and in the brain, while OPCs (Oligoproanthocyanides) are most effective outside the cells and in the lymphatic system. Crystalline salt, however, works everywhere in the body. Once it is introduced into the system a profound regeneration of the cell membranes becomes possible. Other antioxidants are also enhanced in their effectiveness when crystal salt is present. That’s because crystal salt contains all 72 mineral elements believed essential for health in ideal proportion. And what’s equally important is that these minerals are in ionic form and only one angstrom in particle size. An angstrom is one million times smaller than a micron, which is the particle size of the colloidal minerals sold by many health companies today. This means the minerals in crystal salt are more readily absorbable and usable than those in colloidal form, since the body doesn’t have to break them down into smaller particles. And because of its balanced mineral spectrum, crystal salt affects your acid/alkaline balance in a most positive way. If you are overly acidic, the salt helps to alkalize the body very quickly. If you are overly alkaline, which is rare but happens in some cases, it helps rebalance your minerals, because over alkalinity is usually simply a mineral imbalance in the mineral metabolism of your body. So either way, Himalayan crystal salt is a great asset to having a completely balanced acid/alkaline metabolism. And because of the salt’s electrolyte properties it’s a great pick-me-up after a hard exercise workout. Just take a glass of filtered water, add a pinch of salt and a squeeze of lemon juice, and you’ll have a broad spectrum of naturally occurring electrolytes to replenish those lost by the body during physical activity. Another possible benefit from using the salt could be the lessening of certain cravings. According to Traditional Chinese Medicine, refined salt is extremely yang or rigidifying. That’s why using it excessively can lead to hardened deposits in the body and stiffening joints and blood vessels. Sugar and alcohol are extremely yin, or energetically softening, so often the over consumption of refined salt leads to cravings of sweets and alcohol in the body’s effort to bring balance to an overly yang environment. Because using crystalline salt helps bring a natural balance to the system overall, it may actually alleviate, instead of aggravate, sugar and alcohol cravings and the binge eating of sweets in some people. FYI, Himalayan crystal salt can be found at any health food store and a growing number of regular supermarkets. However, I always buy mine on-line because it’s much less expensive that way. One of my favorite discount places to shop is iHerb.com (use code CJG192 if you are a new customer and spend more than $40 and you will get $10 off and free shipping, plus can choose something from their free samples and take advantage of their wonderful trial offer section. The Khewra Salt Mine is also known as Mayo Salt Mine, in honour of Lord Mayo, who visited it as Viceroy of India. The mine is a part of a salt range that originated about 800 million years ago, when evaporation of a shallow sea followed by geological movement formed a salt range that stretched for about 300 kilometers (185 miles). The salt reserves at Khewra were discovered when Alexander the Great crossed the Jhelum and Mianwali region during his Indian campaign. The mine was discovered, however, not by Alexander, nor by his allies, but by his army’s horses, when they were found licking the stones. Himalayan salt is millions of years old and pure, untouched by many of the toxins and pollutants that pervade other forms of ocean salt. Known in the Himalayas as “white gold,” Himalayan Crystal Salt contains the same 84 natural minerals and elements found in the human body. This form of salt has also been maturing over the past 250 million years under intense tectonic pressure, creating an environment of zero exposure to toxins and impurities.Table salt is composed of 97.5% sodium chloride and 2.5% chemicals like iodine and absorbents, and sugar. Common salt is dried at more than 1,200° Fahrenheit, a process which zaps many of the natural chemical structures. 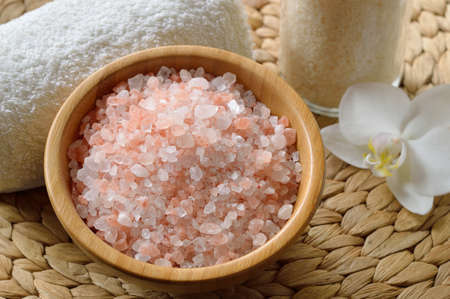 Himalayan salt’s unique cellular structure allows it to store vibrational energy. Its minerals exist in a colloidal form, meaning that they are tiny enough for our cells to easily absorb. till now. But, what concerning the bottom line? Are you sure about the source?